NO RESPONSIBILITY TAKEN FOR UNINSURED PARCELS. Carved Umbrella Parasol Recond c1910. We bought a small collection of vintage and antique umbrellas and are listing them today. All have had the canopies professionally reconditioned and we understand that possibly the shaft finials and the rib tips and the tassels may also no longer be original. All the main shafts, ribs and handles are original. 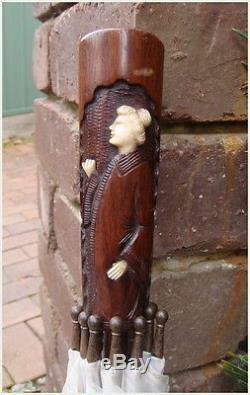 Lovely oriental-theme umbrella with a wonderful carved handle and wooden shaft. Made by quality English firm of S Fox and Co who started their Paragon range around the date of this umbrella. I believe the rib tips are original. Reconditioned as described in the DESCRIPTION so in full working order. The handle is about 14cms in length. The item "Antique Fox&Co Oriental PARAGON Carved Umbrella Parasol Recond c1910" is in sale since Saturday, July 09, 2016. This item is in the category "Clothing, Shoes, Accessories\Vintage\Vintage Accessories\Umbrellas & Parasols". The seller is "madamsteptoe" and is located in Kaleen, Australian Capital Territory. This item can be shipped to Australia, to North, South, or Latin America, to all countries in Europe, to all countries in continental Asia, to New Zealand.